A thick black powder spread across a car seat… The European thought nothing of it. But to his African companion it was a sign, a deadly sign of a Ju-ju attack. A curse so potent that its victim was helpless -and doomed. ‘Jungle Magic’ is a fascinating text which will be of great interest to anyone with an interest in Voodoo, the Occult, and matters cognate. 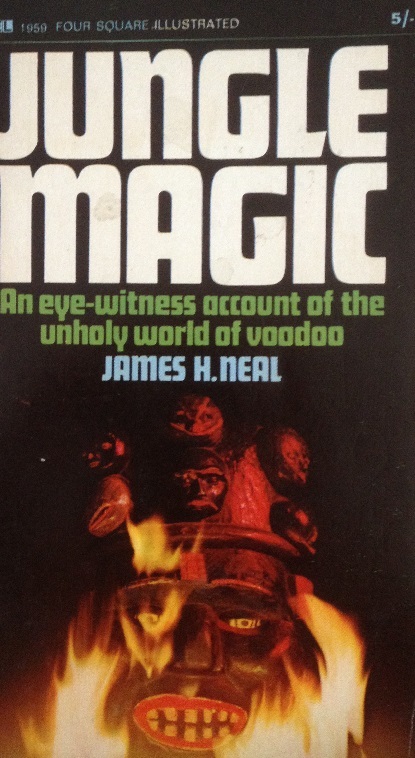 This startling biographical account of James H Neale’s first-hand experiences of the Voodoo religion in Ghana during British rule in the 1950s will make even the most sceptical of souls consider the power and potency of this ancient faith. The startling accounts of Neale’s experiences in this exciting environment ensure that ‘Jungle Magic’ is a real page turner. But perhaps it is the consistency of his objective and rational narrative voice which make the preternatural occurrences all the more believable and frightening. He appears to deliver his anecdotes in an unassuming fashion calmly inviting the reader to make up his or her own mind about the veracity of Voodoo. Neale’s strength as a writer is most certainly his sobriety when faced with with such a controversial, sensitive and unworldly subject. I am amazed that ‘Jungle Magic’ is currently not in print and hardback copies vend for around £25 on Amazon. I was very fortunate to pick up a paperback edition in a local bookshop for £5. Hopefully you will be able to procure a copy if this subject is of interest to you. Why not visit my website for more things magical? Magical David Fox.